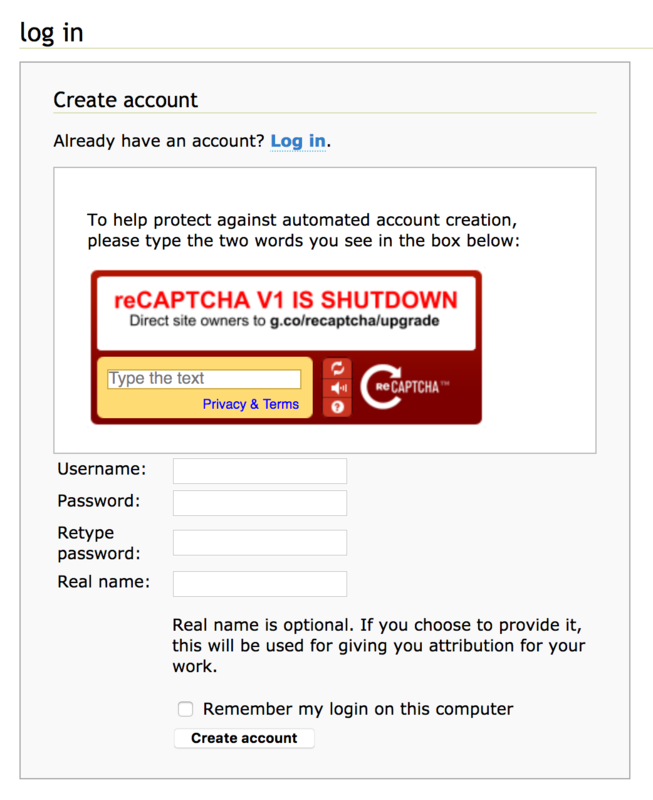 Registration is defunct, in that new users are required to pass a reCAPTCHA V1 which has shutdown. Recommend closure of issue #3704, works for me, no changes to HTML Standard needed. Login error: Incorrect or missing confirmation code. …and as can be seen in the screenshot above, there’s no way to pass the captcha — it doesn’t display in any captcha text, so there’s nothing you can type into the Type the text input field to match. FWIW, the captcha check fails open, so any input is accepted. E.g. I created a new account using "kittens kittens" as the captcha solution. The microformats wiki still includes the defunct captcha for user registration. Additionally passing the captcha is required in order to post external links (references, links to implementations, examples …), but it has not been possible to pass it anymore for months. This has been known to site administrators for at least four months. Sorry, but this is unacceptable for a website which is officially responsible for HTML's rel extensions and thereby also determines whether HTML errors are reported by HTML validators or not. Please fix microformats.org as soon as possible or create an alternative solution to register rel values. Please fix microformats.org as soon as possible or create an alternative solution to register rel values. I’d support moving the existing set of allowed values from the microformats wiki into the HTML spec, and making the new registration mechanism be that when you want to add a new value, you create a pull request with a patch.